Experience the true thrill of rapids on this exciting morning whitewater tour on the Bow River, with cliff jumping available for the adventurous. The class 3-4 Horseshoe Canyon section offers spectacular scenery, big waves and a sense of remoteness while you raft your way through shale canyons and awesome whitewater. Conveniently located 45 minutes from Calgary and Banff in the front ranges of the Canadian Rocky Mountains. First you’ll ride along the Bow River while watching for wildlife and enjoying the spectacular scenery. Midway through the ride, you’ll arrive at 3 Mile Cabin to enjoy genuine western hospitality and some tasty comfort food for dinner. But before digging in, work up an appetite with a few western style games, like lassoing and horse-shoes. Horseback rides depart from Warner Stables in Banff. Guests should be physically fit and have a reasonable swimming ability. How long is the Cowboy BBQ Cookout Horseback Ride? The tour runs for three hours, which includes two hours of horseback riding. Please arrive 30 minutes prior to your tour start time. The start time for this ride varies throughout the season and starts at 4pm (fall) and 5pm (spring/summer). What does the Cowboy BBQ Cookout Horseback Ride include? Where is the meeting point for the horseback ride? Please meet at Warner Stables, the big red stables located at the end of Sundance Road in Banff. When you arrive, please check-in for your ride at the office in the east barn which has signs for ‘Warner Stables’ and ‘office’. There is plenty of free parking at the site. 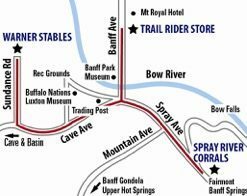 The stables are located approximately a five minute drive or a 20 minute walk from downtown Banff, and there is plenty of free parking at the site. When should I arrive for the horseback ride? What should I wear for the horseback ride? Can I bring a backpack on the horseback ride? Every guest needs to sign a waiver form. Any guest under 18 years will also need a parent or legal guardian signature on the waiver form and an emergency contact number if the Parent/ Guardian is not joining them on the tour (documentation may be required to confirm the signatory’s authority). Please note that the Horseshoe Canyon Whitewater Rafting Tour requires a minimum of 8 participants and the Cowboy BBQ Cookout Horseback Ride requires a minimum of 4 participants, please call the day prior to confirm the tours.